Already from the name "rectangular" triangle, it becomes clear that one angle is 90 degrees. The remaining angles can be found by remembering some simple theorems and properties of triangles. 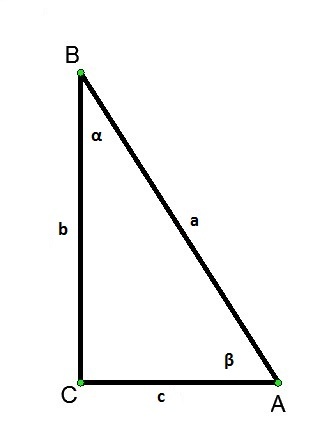 Denote the angles of a triangle with the letters a, B, and C, as shown in the figure. The angle BAC is 90º, the other two corners will be denoted by letters α and β. The legs of the triangle will be denoted by the letters a and b and the hypotenuse c.
Then sinα = b/c, cosα = a/c. Similarly, the second acute angle of the triangle: sinβ = a/c, cosβ = b/c. Depending on which sides are known to us, calculated the sines or cosines of angles and look at the table Bradis the value of α and β. Finding one of the corners, you may recall that the sum of the internal angles of a triangle equal to 180º. Thus the sum of α and β equal to 180º - 90º = 90º. If one of the unknown sides of a triangle, use the Pythagorean theorem: a2+b2=c2. Derive from it the expression for the unknown side using the other two and substitute into the formula for finding the sine or cosine of one of the corners. 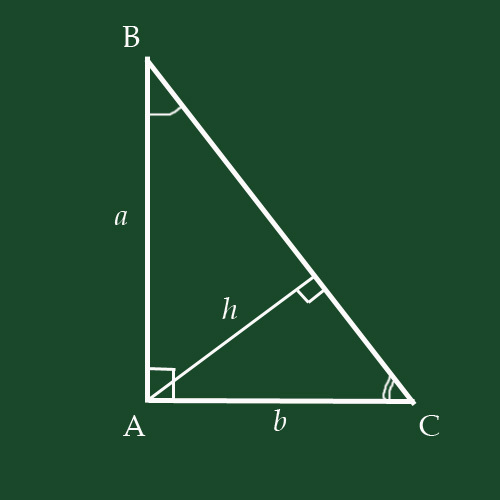 The height h divides the triangle ABC into two right-angled triangles similar to it. It triggered signs of similarity of triangles in three corners. Call the hypotenuse side in a right triangle that lies opposite the right angle. The hypotenuse is the longest side in a right triangle. The other sides in a right triangle are called legs. The squared length of the hypotenuse equals the sum of the squares of the other two sides. That is, to find the square of the length of the hypotenuse you need to square the lengths of the legs and fold. The length of the hypotenuse is equal to the square root of the square of its length. To find its length, extract the square root of the number equal to the sum of the squares of the legs. The resulting number will be the length of the hypotenuse. The length of the hypotenuse is a positive value, therefore, when extracting the root, radical expression must be greater than zero. In an isosceles right triangle the length of the hypotenuse can be calculated by multiplying the leg to the root of the two. Among the many different shapes on the plane stand polygons. The word "polygon" indicates that this figure different angles. A triangle is a geometric shape bounded by three mutually intersecting straight lines, which form three internal angles. 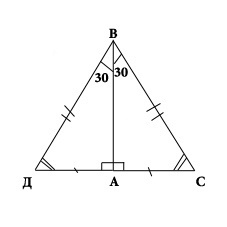 There are various triangles, for example: obtuse triangle (angle is such a figure more than 90 degrees), angled (angle less than 90 degrees) right triangle (one angle of this triangle is exactly 90 degrees).Consider the right triangle and its properties, which are established using theorems on the sum of the angles of a triangle. Theorem: the sum of the two acute angles of a right triangle is equal to 90 degrees. The sum of all angles in a triangle equal 180 degrees, a straight angle always equals 90 degrees. Therefore, the sum of the two acute angles of a right triangle is equal to 90 degrees. Second theorem: the leg of a right triangle, opposite the angle of 30 degrees is half the hypotenuse. Consider the triangle ABC. The angle is A straight angle equal to 30 degrees, hence the angle equals 60 degrees. It is necessary to prove that AC is equal to one second aircraft. 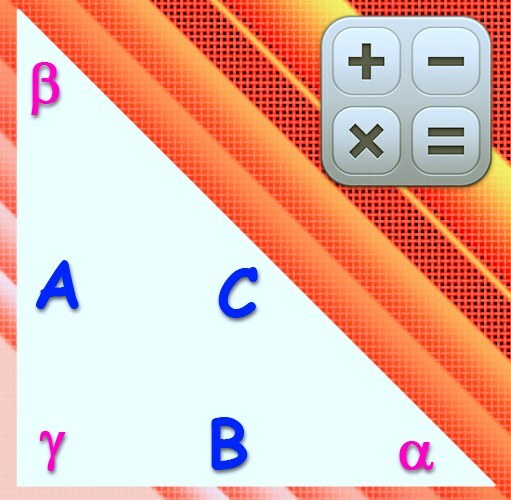 To attach to the triangle ABC equal to triangle AED. Turns out the ESP triangle in which the angle In equals the angle D, therefore 60 degrees, so DS is equal to the sun. But as DS is equal to one second. From this it follows that AC is equal to one second aircraft. If the leg of a right triangle is equal to half the hypotenuse, the angle opposite that leg is 30 degrees - this is the third theorem. You must consider the triangle ABC, whose side AC is equal to the half of the sun (hypotenuse). 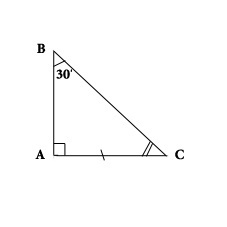 Prove that the angle ABC is 30 degrees. Apply to the triangle ABC equal to triangle AED. Should be an equilateral triangle IRR (VS = DM = DV). The angles of a triangle are equal to each other, so each angle is 60 degrees. In particular, the angle of the internal combustion engine is equal to 60 degrees, and the angle of the internal combustion engine equal to two angles of ABC. Therefore, the angle ABC is 30 degrees. What we wanted to prove. Directlythe coal , the triangle is probably one of the most famous, from a historical point of view, geometric shapes. Pythagorean pants" competition may be only a "Eureka!" Archimedes. As a rule, the vertices of the angles of a triangle are denoted by capital Latin letters (A, B, C), and the opposite side of the small Latin letters (a, b, c) or by the names of the vertices of the triangle constituting that side (AC, BC, AB). 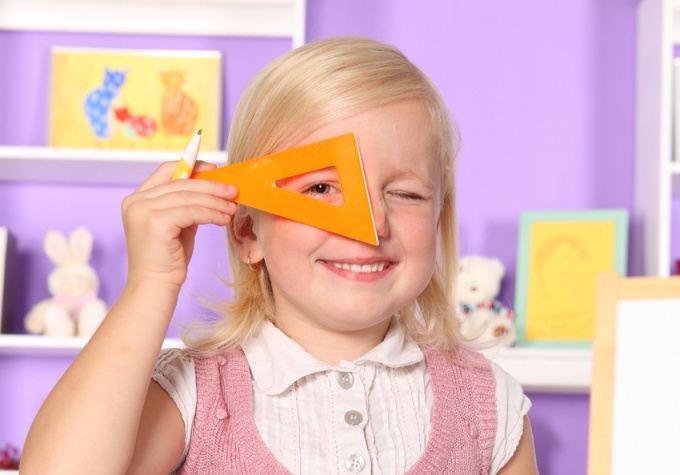 The sum of the angles of a triangle is 180 degrees. In a rectangular triangle, one angle (straight) will always be 90 degrees and the other acute, i.e. less than 90 degrees each. To determine the angle in a rectangular triangle is straight, measure with a ruler the sides of the triangle and determine the greatest. 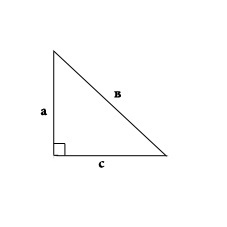 It is called the hypotenuse (AB) and is located opposite the right angle (C). The other two sides form a right angle are called legs (AC, BC). 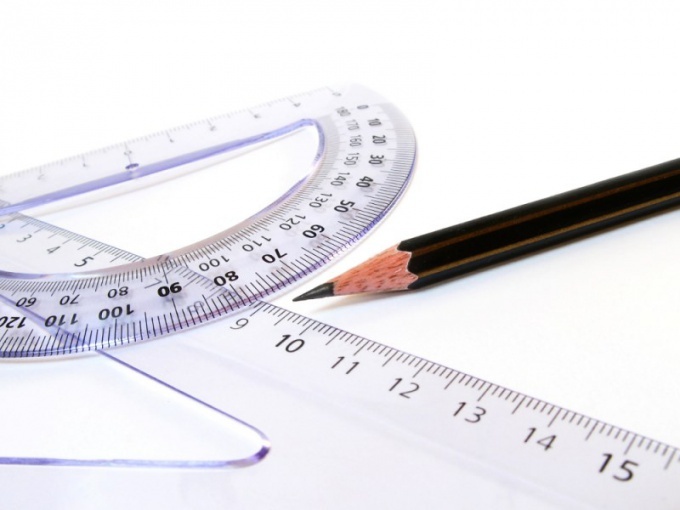 When it is determined what the angle is sharp, you can either measure the angle with a protractor, or calculated using mathematical formulas. 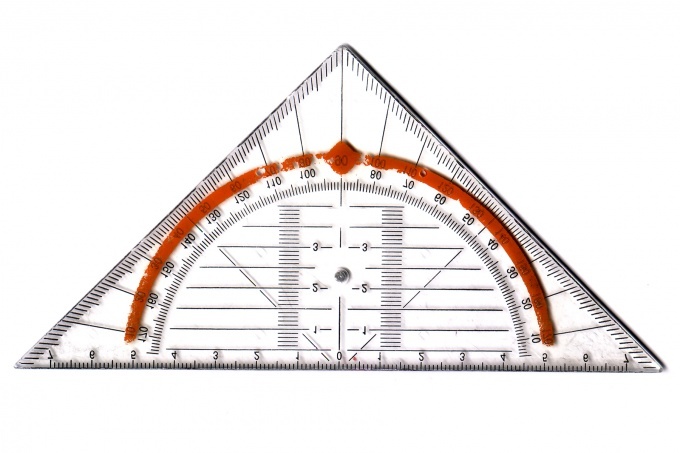 To determine the measure of the angle with a protractor, align the top (let's denote it by the letter A) with a special mark on the ruler in the center of the protractor, the side AC must coincide with its upper edge. Note on the circular part of the protractor to the point, through which the hypotenuse AB. The value at this point corresponds to the angle in degrees. If the protractor provided (2) the values for acute angle need to choose smaller, for the stupid - big. The angle can be calculated by making simple mathematical calculations. 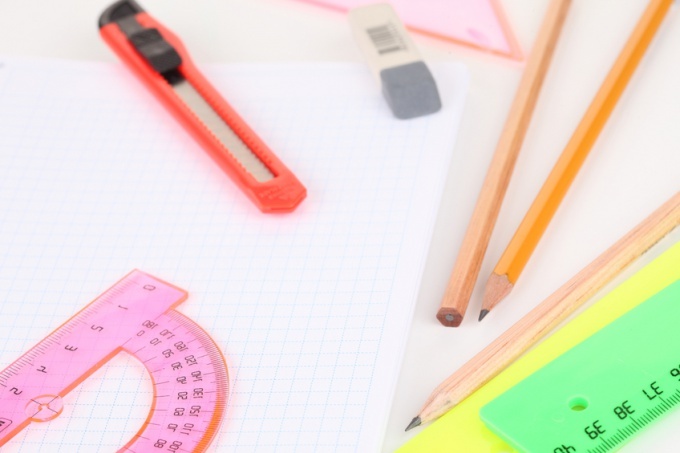 You will need a basic knowledge of trigonometry. If you know the length of the hypotenuse AB and leg sun, calculate the value of the sine of the angle A: sin (A) = BC / AB. The resulting value find the reference tables Bradis and determine what angle corresponds to the obtained number. This method was used by our grandmothers. Switch calculator mode to inverse functions, click INV on the scoreboard calculator, then click calculate arcsine functions (on the scoreboard indicated, as sin to the minus one). In the window calculation will appear the following inscription: asind (0.5) = 30. I.e., the value of the desired angle of 30 degrees. Call the hypotenuse side of a right triangle that lies opposite the right angle. It is the largest side of a right triangle. To be calculated by the Pythagorean theorem, or by using the formulas of trigonometric functions. The other two sides are called the sides of a right triangle adjacent to the right angle. In the figure, the legs are designated as AB and BC. Imagine you are given the lengths of both legs. Denote them as |AB| and |BC|. In order to find the length of the hypotenuse |AC|, we will use the Pythagorean theorem. According to this theorem the sum of the squares of the legs equals the square of the hypotenuse, i.e., in the notation of our pattern |AB|^2 + |BC|^2 = |AC|^2. From the formula we find that the length of the hypotenuse AC is as |AC| = √(|AB|^2 + |BC|^2) . Let's consider an example. Imagine you are given the lengths of the legs |AB| = 13, |BC| = 21. By the Pythagorean theorem we see that |AC|^2 = 13^2 + 21^2 = 169 + 441 = 610. In order to obtain the length of the hypotenuse, you must extract the square root of the sum of the squares of the other two sides, i.e., number 610: |AC| = √610. Using the table of squares of integers, it appears that the number 610 is not a complete square of any integer. In order to obtain the final value of the length of the hypotenuse, try to make a full square under the root sign. To do this, divide the number 610 to multipliers. 610 = 2 * 5 * 61. The table of Prime numbers looking 61 is a Prime number. Therefore, further reduction of the number √610 impossible. Get the final answer |AC| = √610. If the square of the hypotenuse was equal to, for example, is 675, then √675 = √(3 * 25 * 9) = 5 * 3 * √3 = 15 * √3. In the event that such a cast may perform a reverse check - raise the result in the square and compare it to the original value. Let us known one of the legs and adjacent to it a corner. For definiteness, let it be a leg |AB and angle α. Then we can use the formula for the trigonometric functions cosine the cosine of an angle is equal to the ratio of the adjacent leg to the hypotenuse. I.e., in our notation cos α = |AB| / |AC|. 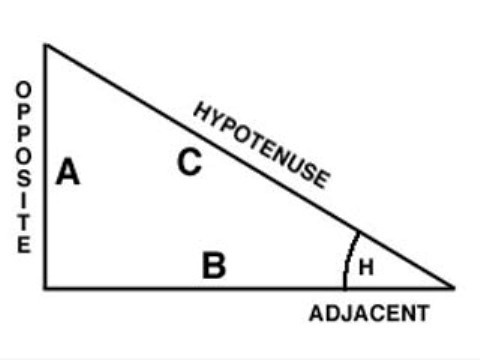 Hence we obtain the length of the hypotenuse |AC| = |AB| / cos α. If we know the side |BC|, and the angle α, we use the formula for calculating the sine of an angle is the sine of the angle is equal to the ratio of the opposite leg to the hypotenuse: sin α = |BC| / |AC|. We find that the length of the hypotenuse is |AC| = |BC| / cos α. For clarity, consider an example. Given the length of the leg |AB| = 15. And the angle α = 60°. Get |AC| = 15 / cos 60° = 15 / 0.5 = 30. Consider how you can check your result by using the Pythagorean theorem. To do this we need to calculate the length of the second leg |BC|. Using the formula for the tangent of the angle tg α = |BC| / |AC|, we get |BC| = |AB| * tg α = 15 * tg of 60° = 15 * √3. Next apply the Pythagorean theorem, we get 15^2 + (15 * √3)^2 = 30^2 => 225 + 675 = 900. The validation is completed. Calculating the hypotenuse, do the test - whether the value obtained using the Pythagorean theorem. Rectangular is a triangle whose one of the angles is a straight line. Side of the trianglelocated opposite the right angle is called the hypotenuse and the other two sides the legs. To find the lengths of the sides of a rectangular triangle, you can use several ways. P = a + b + c, where P is the perimeter of a rectangular triangle. From this expression it is easy to Express the length of any of sides of a rectangular triangle. Call the hypotenuse the longest side in a right triangle, therefore, not surprising that in the Greek language this word is translated as "stretched". This side is always opposite the angle to 90° and the sides that form the angle are called the legs. Knowing the lengths of these sides and the magnitude of the acute angles in different combinations of these values, we can calculate the length of the hypotenuse. If you know the lengths of both legs of the triangle (A and b), then use to find the length of the hypotenuse (C) is probably the most famous on the planet a mathematical postulate - the Pythagorean theorem. It States that the square of the length of the hypotenuse is equal to the sum of the squares of the lengths of the legs, from which it follows that you should calculate the square root of the sum of squared lengths of two known sides: C=√(A2+B2). For example, if the length of one leg is 15 inches and the other 10 centimeters, the length of the hypotenuse will be approximately 18,0277564 centimeters, as √(152+102)=√(225+100)= √325≈18,0277564. If you know the length of only one of the legs (A) in a right triangle, and the angle lying opposite it (α), the length of the hypotenuse (C) can be determined using one of the trigonometric functions - sine. To do this, divide the length of the known side by the sine of the known angle: C=A/sin(α). For example, if the length of one of the legs is equal to 15 centimeters and the angle at the opposite vertex of the triangle is 30°, the length of the hypotenuse is equal to 30 centimeters, as 15/sin(30°)=15/0,5=30. If in a right triangle, we know the value of one of the acute angles (α) and the length of the adjacent leg (B), to calculate the length of the hypotenuse (C) you can use another trigonometric function, the cosine. You should divide the length of the known leg to the cosine of the known angle: S=V/ cos(α). For example, if the length of this side is 15 centimeters and the magnitude of the acute angle, the Annex, is 30°, the length of the hypotenuse will be approximately 17,3205081 centimeters, as 15/cos(30°)=15/(0,5*√3)=30/√3≈17,3205081. Known problem on the sides of a right triangle of school geometry is the basis of many geometrical theorems, and the whole course of trigonometry. Let's consider a given triangle with vertices A, B and C, and the angle ABC is a straight line, that is equal to ninety degrees. 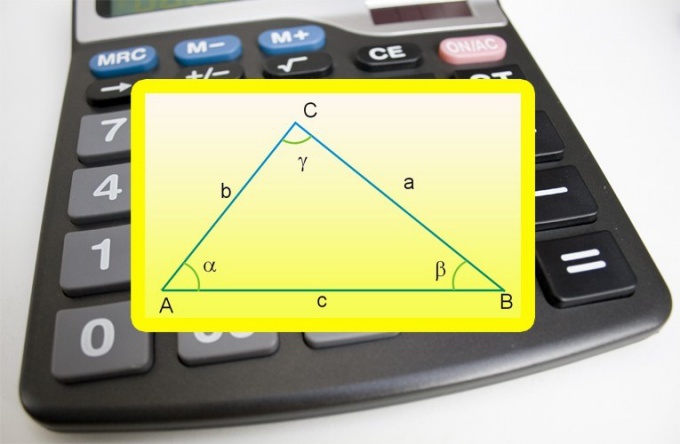 The sides AB and BC of the triangle are called the legs, and the side AC is the hypotenuse. For starters, look at the conditions of the problem and determine the magnitude of any side of triangle you are aware of, and which way you want to find. For a successful solution you need to know the lengths of two of the three sides of the triangle. You must know either the lengths of two sides, or the length of one of the legs and the length of the hypotenuse. The length of the sides of a right triangle is calculated by the theorem of the Greek mathematician Pythagoras. This theorem specifies the relationship between the legs and the hypotenuse: the hypotenuse squared is equal to the sum of the squares of the legs. If you want to find the leg length (for example, side AB), the formula for it will look like this: AB = √(AC2 - BC2). To calculate it on the calculator, but in some cases can be in the mind. For example, for a triangle with sides BC = 4 and AC = 5 leg length AB is also an integer and therefore can be easily calculated by the above formula. AB = √(25 - 16) = 3. 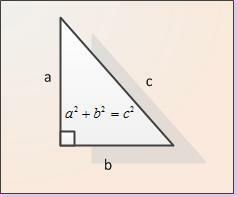 If you want to find the length of the hypotenuse, then this can be done according to the following formula derived from the Pythagorean theorem: AC = √(AB2 + BC2). So, for a triangle with sides AB = 5 and BC = 12, the result obtained AC = √(25 + 144) = 13. 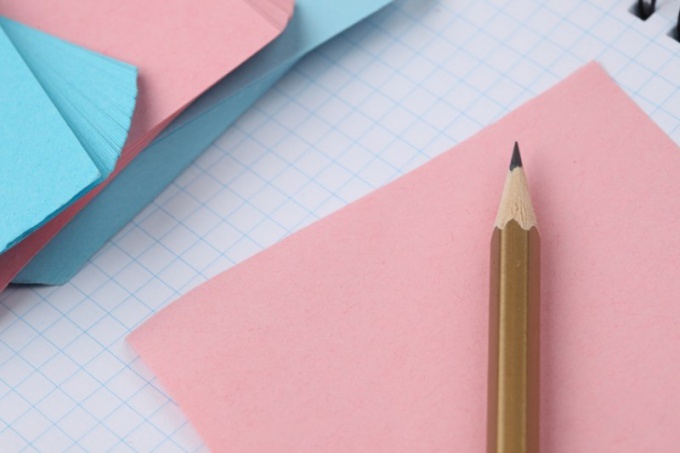 Depending on the conditions of the problem use the result in further calculations, or write as your answer. Mathematics is often inappropriate calculation of the exact values of square roots and cube roots. If the resulting formula result is not an integer or a fractional number, it is better to leave the square root symbol and not think of the answer on the calculator. For example, record the response as AC = √7 instead of having to calculate its value — 2,6457. If one of the angles in a triangle is equal to 90°, then the two adjacent sides can be called the legs, and the triangle is rectangular. The third side in this figure is called the hypotenuse, and its length is associated with, perhaps, known on the planet a mathematical postulate - the Pythagorean theorem. However, to calculate the length of this side, you can use it. The Pythagorean theorem use to find the length of the hypotenuse (C) of a triangle with known values of both legs (a and b). You need to put their sizes in square and folded, and the result extract the square root: c = √(a2+b2). If the sizes of both of the other two sides (a and b) in terms of the given height (h), descended on the hypotenuse (c), the need for the calculation of degrees and roots will disappear. Multiply the length of the shortest sides and divide the result by the height: c = a*b/h. At known values of the angles at the vertices of a right triangle adjacent to the hypotenuse and length of one of the other two sides (a), use the definitions of trigonometric functions - sine and cosine. Choosing one of them depends on the mutual arrangement of the known side and is involved in the calculation of the angle. If the leg is opposite the angle (α), so from the definition of the sine is the length of the hypotenuse (c) must be equal to the product of the length of this leg to the sine of the opposite angle: c = a*sin(α). If involved angle (β), which is adjacent to the known side, use the definition of cosine multiply the length of the side adjacent to the cosine of the angle: c = a*cos(β). Knowledge of the radius (R) circumscribed about the right triangle circumference makes the calculation of the length of the hypotenuse (c) is a very simple task - just increase this value twice: c = 2*R.
The median, by definition, bisects the side to which it is omitted. As follows from the previous step, half of the hypotenuse is equal to the radius of the circumscribed circle. Since the vertex on the hypotenuse may be omitted median, also have to lie on the circumscribed circle, the length of this cut equal to the radius. So, if the length of the median (f) omitted from the right angle, is known, to calculate the size of the hypotenuse (c) you can use a formula similar to the previous one: c = 2*f.
The triangle is called rectangular, if the corner of one of its vertices is equal to 90°. The side that is opposite this vertex is called the hypotenuse and the other two - legs. The lengths of the sides and angles in this figure are connected to the same ratios as in any other triangle, but since the sine and cosine of a right angle is equal to one and zero, and the formula is much simpler. If the length of one of the legs (a) and the hypotenuse (C) of a right triangle are known, calculate the length of the third side (b) the Pythagorean theorem. It follows that the required value must be equal to the square root of the difference between the squared length of the hypotenuse and the square of the length of the known leg: b = √(c2-a2). Knowing the measure of the angle (α) at the vertex of the triangle lying opposite the side of known length (a), it is also possible to calculate the unknown length of the second leg (b). To do this, apply the definition of trigonometric functions - tangent for acute angle. It implies that the desired length of leg should be equal to the size of the known side divided by the tangent of the opposite angle: b = a/tg(α). The definition of cotangent for an acute angle use to find the length of side (b) in the event that if in the conditions of the given angle value (β), attached to another leg of known length (a). The formula in General will look almost the same as in the previous step, replace it with only the function name and designation of the angle: b = a/ctg(β). At a known length of the hypotenuse (c) in the calculation of the size of the leg (b) use the definitions of the basic trigonometric functions - sine and cosine for acute angles. If the conditions given, the angle (α) between the two sides of the two functions, should choose the cosine. Multiply the length of the hypotenuse the cosine of the known angle: b = c*cos(α). Definition of sine for acute angles use in cases when, besides the length of the hypotenuse (c) is given the value of the angle (β) at the vertex lying opposite the required side (b). The formula in General will be similar to the previous one - it must contain the product of the length of the hypotenuse to the sine of the angle specified value: b = c*sin(β).